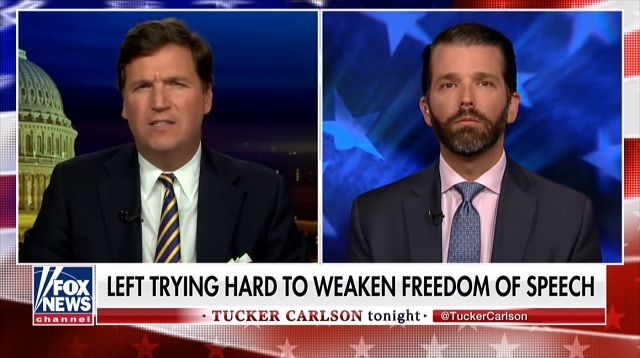 On his show Tuesday night on Fox News, Tucker Carlson talked about the threat of “woke capital” censoring right-wingers all over the internet with Donald Trump Jr and asked what the point was of having a Republican Senate if they’re not even willing to stand up for the free speech rights of their own voters. “What’s the point of having a Republican Senate if they can’t stand up for free speech when their own voters are being targeted?” Carlson said. He noted how PayPal banned Alex Jones, Laura Loomer and the immigration restrictionist website VDARE and highlighted how the CEO of PayPal, Dan Schulman, told the Wall Street Journal he’s been working with the Southern Poverty Law Center to decide who to ban. PayPal’s CEO made a big admission — the company tskes advice from the disgraced SPLC. The SPLC has had to pay million dollar settlements for falsely accusing people of bigotry. This was one of the greatest monologues ever delivered on TV. Watch it in full above.